Cocktail lovers – don’t miss the one-off takeover event taking place next week in Cask, Cork, who will welcome top London cocktail bar Coupette. 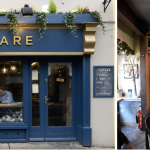 Ireland’s newly crowned Bar of the Year 2018, Cask cocktail bar and food venue on MacCurtain Street in Cork city’s Victorian Quarter, is hosting an exciting once-off bar takeover by Chris Moore of the multi-award-winning London cocktail bar Coupette on Monday the 17th of September. Chris Moore was head bartender of the world-renowned Beaufort Bar in the Savoy Hotel, London before opening French-influenced Coupette in spring 2017 in Bethnal Green. The Coupette ethos combines innovation, simplicity and glamour together with a local, seasonal approach using lesser-known ingredients like Calvados, cidre and poiré. Coupette won Best New International Cocktail Bar at the 2018 Spirited Awards, with Chris shortlisted for the International Bartender of the Year award. 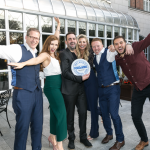 Chris will co-host the takeover alongside Cask’s Andy Ferreira and Carl D’Alton, who are also prestigious award-winners, with both having represented Ireland internationally as winners of the World Class Irish Barman of the Year competition in 2017 and 2018 respectively. On his menu for the Cask takeover, Chris — who is known in the industry as “Mr Calvados” — will be featuring his signature cocktail ‘Apples’, which mixes Calvados apple brandy with cold-pressed apple juice that he carbonates daily in-house. The calvados and apple that Chris uses to make ‘Apples’ change each month in order to showcase the depth and variety available. In order to stay true to this ethos, Andy and Carl from Cask will be taking Chris to visit two local apple growers and drinks producers — Longueville House, producer of cider and apple brandy, as well as Killahora Orchards, which produces cider, apple port and ice wine made from apples. Chris’s menu will also feature his signature Champagne Pina Colada cocktail, a modern twist on the classic. The Chris Moore – Coupette to Cask event starts from 7.00pm on Monday the 17th of September at Cask. Cask is located at 48 MacCurtain Street in Cork’s city centre, next door to Hotel Isaacs and Greenes Restaurant. Cask is open seven days, with the kitchen open Monday to Saturday from 5pm until 10pm and on Sunday from 1pm until 10pm. The official Cask website is at www.caskcork.com. You can follow Cask on Facebook @CaskCork , Instagram: @CaskCork and Twitter @Cask_Cork for regular updates.